Were you expecting more? They never seem to put much on DVD special features anymore. An audio commentary would have been nice. But then again, according to Jared Leto, he still hasn't even seen the movie yet! Some actors refuse to watch their own movies. He said he'd watch it eventually but doesn't want to right now because he'd be too judgmental. I would probably feel the same way if I was in a movie. But I'd watch it. I think it seems kind of stuck up when you don't watch your own movies. You spent all that time making it -- can't you at least watch it? Maybe it's just awkward for them to watch themselves? I remember making a home video type of thing with my buddies for a class presentation. During the playing of the video, we all had our heads down (I had my trusty hoodie with me that day). After we showed it to the class, I took the file and promptly deleted all traces of it. We all vowed to never speak of it again. I don't think the video was bad or anything like that (it seemed like the class laughed most at ours, which was the intended effect). We just didn't want to see ourselves on a screen, I guess. I remember wanting to film the whole thing over again after we filmed it because I didn't like how I looked -- and especially, how I sounded. But actors in movies... movies are supposed to make you look good. You should at least wanna watch yourself in a movie. Millions of other people are. Thanks for the commentary. I've not seen the film, but I enjoyed reading the comments. Great commentary from two people who obviously like/love this film. I actually liked it more the first time I saw it, but I think my rating might've slipped a little because I was distracted. I think I gave it a 4.5 on my first viewing. Speaking of slip, I think I said somewhere in here that it was my second favorite film of last year. Actually it's my third favorite, behind The Wolf of Wall Street. I think it has the potential though to overtake Wolf with repeated viewings. 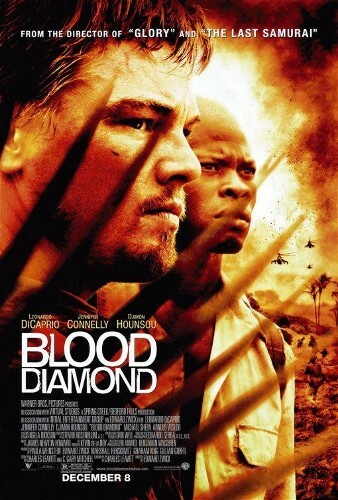 I've always thought Djimon had skill as an actor. Emotional scene of the village getting literally killed. WTF. you started without me. I just got done getting ready.